This review is pretty much spoiler-free as far as story content goes, but there is some discussion of characters and how the game ends. Not what happens at the end, rather how it fits into the game's DLC structure. Unlike the recent sequel Final Fantasy X-2 which continued the story of Final Fantasy X but took the characters, the story, and the combat in a new direction, The After Years is about as pure as sequels get. Like Mega Man 9, it is faithful not only to the gameplay of the original but to the audio/visual style as well. The sprites, the world, the music, the interface, all of it will be like coming home for long-time Final Fantasy fans. There are a few new faces in the cast, some minor rearrangement of the dungeons, but from the opening theme until the final credits the whole experience feels totally grounded in the world of Final Fantasy IV. This familiarity provides a great rush of nostalgia, but at times it feels like you're backtracking through environments and scenarios you already played 18 years ago. Odds are if you remember a secret treasure chest from the original, it's unmoved in The After Years. If you remember an enemy's weakness from the original it's the same in The After Years. If you remember endlessly grinding in the original... well, you'll be doing that in The After Years too. Regarding grinding, you don't need to power level to make progress through The After Years. But, you will find that random encounters are extremely frequent. Sometimes it feels like you have to fight a hedgehog every few steps. This was frustrating in 1991, and even more so now that many games - Square Enix games included - have moved beyond this mechanic. Making the frequent random encounters even more frustrating is the fact that few, if any, require any real strategy. For most fights just press the "A" button about 20 times and wait for the victory fanfare, heal up after the battle, and repeat. For the majority of The After Years you'll be playing as a party of two characters, Ceodore - a Palaidn type - and "The Hooded Man" - a straight fighter. Ceodore has some white magic for healing, and an ability similar to Terra's "Morph" from Final Fatnasy VI which gives him a decent stat boost though eventually costing HP. But this is a class based game, and for all intents and purposes both Ceodore and The Hooded Man are fighters. That means you'll be pressing the Attack button... a lot. 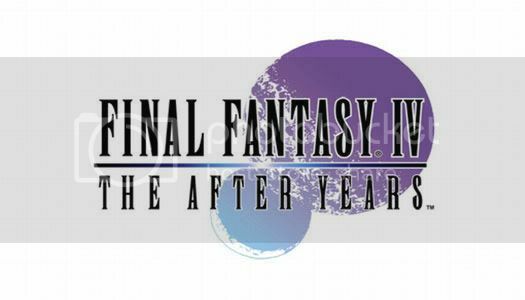 The After Years introduces two new systems to Final Fantasy IV, the Band system and the phases of the moon. Both are very cool in theory, but never really live up to their potential in the main story. The Band system allows two characters to combine attacks, similar to Chrono Trigger. The catch is that the two characters have to share a bond, and most band attacks have to be discovered through trial and error. The band attacks are neat, but since you spend most of the game as Ceodore and the Hooded man, you don't have a lot of opportunities to take advantage of the system. The phases of the moon adds a time-based element to the game. The moon has four phases, waxing, full, waning, and new. The phase of the moon modifies character abilities. For example, during a full moon weapons are half as effective, but black magic is twice as effective. The phases of the moon shift over time, or whenever you use a tent or stay at an inn. This does add an interesting choice when you're exploring a dungeon. When you reach a save point you need to choose whether to use a tent and change the phase of the moon, or save and move on without the HP & MP boost from the tent to keep the moon as is. The phase system seems like an interesting way to complement the class system, since you can't customize character abilities If you had a diverse party of characters, it would shift the emphasis to different classes at different times. But as I mentioned earlier, for most of the game you only have two fighters. So ultimately the phases don't affect your strategy very much. The main story isn't very long by final fantasy standards. Probably between 4 - 6 hours, depending on how you much grinding you do. It is also extremely linear. Don't expect to find side quests or much exploration off the beaten path. For fans familiar with Final Fantasy IV this linearity will feel pretty familiar. The original didn't open up until after you got the airship. Just be aware that in The After Years the main story never opens up to allow for exploration. The quality of the story and its presentation isn't quite up to the standard set by the original. In general the pacing feels off and the scenes can be confusing and disjointed. The emotional impact of the story relies heavily on your familiarity with FFIV. If you haven't played the original or the DS remake, I would expect The After Years' story to be somewhat confusing, if not outright frustrating. 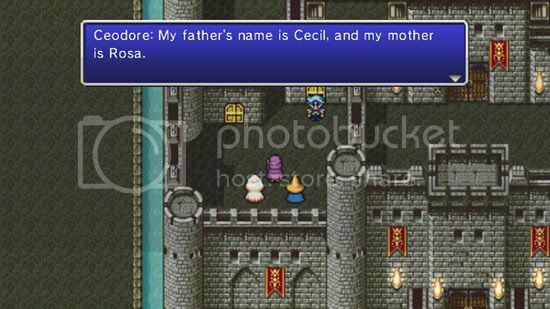 Unlike FFIV, you aren't immediately pulled into the characters and the crisis. Ceodore and Biggs just don't compare to Cecil and Kain. In some ways the story feels like fan fiction. All the elements of Final Fantasy IV are there, but they're missing the artistry that brought the source material to life in a compelling way. That's not to say it's all bad. There is a fantastic set-piece near the beginning that reunites several familiar characters and promises a better story than the one it ultimately delivers. The climax is fantastic for a FFIV fan, but unfortunately the story ends on a cliffhanger right right when it's about to get interesting. To me the ending felt abrupt, and cheap. I felt like I had been primed for a more robust experience, and it cut out just when I was starting to feel hooked. Obviously this is by design. The story continues through various DLC "stories" that you can download. As of today one is available, "Rydia's Tale" for 300 Wii Points. At the end of the Main Story you are able to make a save file that will carry your levels, items, etc. over into the DLC stories. So effectively what we have here is an episodic Final Fantasy game. Personally I'm not opposed to DLC or episodic content, but I'm not sure that it's the format I want to play a Final Fantasy game in. It makes me wonder if the game will ever open up and provide side quests and optional character development, or if instead each pay-to-download Tale is essentially a side quest. It makes reviewing the main story difficult. As a stand-alone experience, it's ripe with potential but skimpy on payoff. It promises a very cool story, some innovative combat mechanics, and a robust full featured sequel in the style of Final Fantasy IV. But it doesn't fully deliver on any of that. If you are a fan of the original and you're willing to stick with The After Years for the long haul, I would recommend downloading the main story and sticking with tales to see how the story develops. The main story is 800 Wii Points. But if you're turned off by retro J-RPG sensibilities and you don't have a lot of affection for the original story, I suspect this game is not for you. 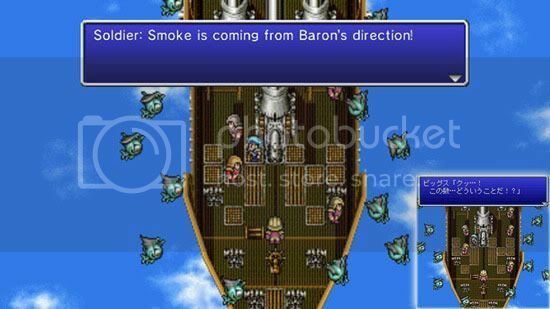 I'd suggest picking up the FFIV remake for the DS and giving it a whirl. If you like it, then by all means download The After Years. Main Story Stand Alone Experience: 6 - A few moments of greatness bookend a lot of old-school grinding. Neat systems are introduced, but don't really deliver. Story ends just as it gets started. Main Story + Tales (Potentially): 7 - 8 - Tales could flesh out a more complete sequel and build on the new mechanics in interesting ways. Final Fantasy IV Fan Spin: +1 - If you love Final Fantasy IV this is a homecoming that will warm your cold dead heart. You'll overlook a lot of the flaws for a chance to spend time with old friends.